Learn how to draw Undersea Animals! 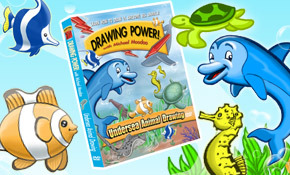 In this DVD: Learn how to draw 14 Undersea Animals, including how to draw a clownfish, seahorse, whale, dolphin and more! Artist Michael Moodoo show viewers how to draw undersea animals with easy-to-follow, step-by-step instructions. Drawing Power! with Michael Moodoo DVD series has won awards from Parents' Choice Foundation, Dr. Toy and Kids First! Sale! 33% off DVDs - Limited time offer! Learn how to draw Dragons & more! In this DVD: Learn how to draw castles using 2-point perspective! Learn the secret shapes behind dragons and wizards and use them to create fun, realistic drawings! Artist Michael Moodoo show viewers how to draw with easy-to-follow, step-by-step instructions. Learn how to draw your own Ultimate Room! In this DVD: Learn how to create fun, realistic drawings of your own ultimate Water Slide room with a basketball goal, rope climb, diving board & jacuzzi! In Part 2, Draw a Monkey theme room with monkey bars, rock climb, banana tree, monkey bed & more! FREE drawing lessons, tips & more! Learn how to draw Safari Animals! Learn how to draw an elephant, giraffe, poison dart frog, toucan and lion! Reviews: "In clear, step-by-step instructions, Moodoo shows how to combine easily-drawn elements into realistic animal portraits. Although the presentation is aimed at younger artists, the techniques can be used by anyone interested in learning how to draw animals." Learn how to draw the world of PIRATES! In this DVD: Learn how to draw a Pirate portrait, Pirate ship, Treasure map, Treasure chest, Sea monster, Skull island, Captain Greenbeard, and more! Reviews: "This colorful, instructional production, with its warm and humorous host, will be a hit in elementary art rooms." FREE Drawing Lessons! How to draw Blort, a pirate ship, and more! •Can anyone learn how to draw? Absolutely. Drawing Power! helps students of all ages develop drawing ability and creativity. •How quickly will I be able to learn? In just minutes, Drawing Power! provides step-by-step techniques to create objects, places, and characters from life or imagination. •What materials are needed? Just pencil and paper. Drawing Power! with Michael Moodoo is the innovative DVD series that helps viewers learn secrets of making successful and satisfying drawings. Using "Shape Substitution" and Secret Shape Vocabulary, viewers are able to create realistic drawings you can reach out and touch. These wonderful, charming videos are fun learning tools that children and older viewers enjoy. How did Drawing Power! get started? Artist Michael Moodoo is a former elementary school art instructor, who was searching for a fun way to teach students how to create satisfying, realistic drawings. Mr. Moodoo and his students developed amazing new drawing techniques. The videos are packed with important drawing techniques, such as "Secret shapes". Students learn the names of Secret Shapes, such as "carrot" or "macaroni", and how to use them to make realistic and satisfying drawings. "Shape Substitution" is another Moodoo innovation that takes a complicated, hard-to-draw shape -- for example: a hand -- and breaks it down into Secret Shapes which are easy to draw. Each video includes step-by-step instruction, plus common drawing mistakes and how to fix them. The goal of Drawing Power! is to help viewers of all ages discover the fun of drawing!